Walter Wilson was born on 15 July 1797 in Southdean Parish, Roxburgh, Scotland. Walter Wilson and Ann Dodds appeared in the US federal census of 1 June 1850 in Madrid, St. Lawrence County, New York. Also in the househod were children William (age 21), Ellen (18), Thomas (14) and Isabella (11). He was a merchant, according to the 1850 census. Walter Wilson and Ann Dodds appeared in the US federal census of 1 June 1860 in Waddington, St. Lawrence County, New York. Also in the household were children Thomas (age 23) and Isabella (20) and one female domestic servant. He was a gentleman, according to the 1860 census. Walter Wilson and Ann Dodds, appeared in the US federal census of 1 June 1870 in Waddington, New York. Also in the household was one female domestic servant. He was a retired merchant, according to the 1870 census. Walter Wilson died on 19 November 1873 at age 76 in Waddington, New York. Ann Dodds became a widow at his death. He was interred at Brookside Cemetery, Waddington, St. Lawrence County, New York. The following appeared on 21 November 1873 in The Ogdensburg Journal: [Died] In Waddington, Wednesday morning, 19th inst., Walter Wilson WILSON, in his 77th year. The following appeared on 21 November 1873 in The Ogdensburg Journal: Walter Wilson, one of the oldest and most respected citizens of Waddington, in this County, died at his residence on Wednesday morning, after a brief illness. He had returned from an annual hunting trip to Canada but a short time before he was taken ill. He was an upright, energetic and successful business man, and always sustained a prominent position in the community where he resided. Amiid the bloom of the heather and the tassels of the broom of "bonnie Scotland," the land of Bruce and Wallace, Walter Wilson was born July 15, 1797, and was given the name Walter, that his father [sic] and grandfather had borne before him; his birthplace was also theirs--Gedburgh. He immigrated to St. Lawrence County in 1819. He received a good common-school education in the land of his birth, and his first employment in land of his adoption was teaching. Next he entered the business of his life, merchandising, officiating as a clerk in a store for Mr. Cooper, at Chippewan bay. His mercantile life was a successful one, and, by thrifty habits and sount business judgment, he amassed a handsome competency. While engaged at Chippewan bay he met, wooed, and won an estimable lady, Miss Ann Dodds, a Scotch lassie, and daughter of Thomas Dodds. She was born in 1801, and yet survives, possessing much of the vigor of her early days. [:CR;] To Mr. and Mrs. Wilson were born the following named children: William, Ellen M., Thomas, and Isabella. Ellen M. is now Mrs. L. J. Proctor, of Waddington, with whom the aged mother resides. Thomas also resides in Waddington, and Isabella is now Mrs. J. C. Spencer, and resides in New York city. William is deceased. [:CR;] Mr. and Mrs. Wilson were life-long members of the Presbyterian church, and upon his decease, which occurred Nov. 18, 1873, he left an endowment for that society in Waddington nearly sufficient for its entire support. He did not confine his gifts, however, to his own favorite church, but made fine donation to the Methodist society of his town also. Previous to his death he donated a parsonage to the Presbyterian church. His interest in education was marked and unabating, and in all matters for the public good he maintained an interest, and took an active part in their promotion. In politics he was formerly a member of the Whig party, and on the formation of the Republican organization allied himself to that party, being always a strong opponent of slavery. [:CR;] On his decease, the Ogdensburg Journal thus spoke of Mr. Wilson: [:CR;] "Walter Wilson, one of the oldest and most respected citizens of Waddington, died at his residence on Wednesday morning, after a brief illness. He had just returned from an annual hunting trip in Canada, which was one of his favorite pastimes, a short time before he was taken ill. He was an upright, energetic, and successful business man, and always sustained a prominent position in the community where he resided so many eyars, and is held in high esteem by all surviving friends who once knew him." The following appeared on 28 January 1975 in The Massena Observer: Up until 75 or 80 years ago, Waddington was far ahead of Massena in importance. . . .
. . . . Waddington was formed in 1859 from Madrid [:CR;] Walter Wilson was born in 1797 and died in 1873. When Waddington village was incorporated in 1839, he was one of the first officers. 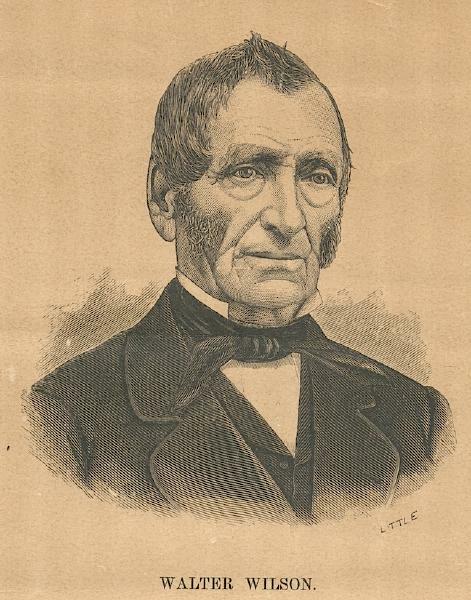 He was president of the village in 1839 and 1849. Later when Waddington became a town, he was its first supervisor and president of the village again in 1867. . . .